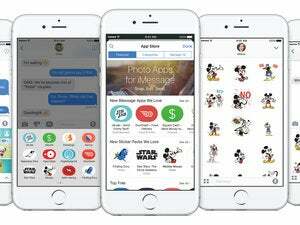 Messages in iOS 10 has new ways to express yourself—a lot of new ways. Here's how to get started. 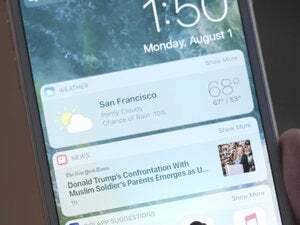 The first thing you should know is that the recipient of your messages will need an iPhone, iPod, or iPad running iOS 10, an Apple Watch running watchOS 3, or a Mac running macOS Sierra in order to view them in their full visual glory. Furthermore, these features are exclusively linked to iMessage, so Android users will have a hard time deciphering the animations as well. For users on Android or running a previous version of iOS, these messages will show up as regular text with a description of what the visual should have been, like “(sent with fireworks).” Not nearly as capitvating. Perhaps the most profound change iOS 10 brings to Messages is the integration of third-party services, turning iMessage into a platform. Access your iMessage app drawer by tapping on the gray arrow to the left of the input field and then on the App Store icon. This is your hub for both iMessage apps (which only live inside Messages) and extensions (which are a part of a broader iOS app). 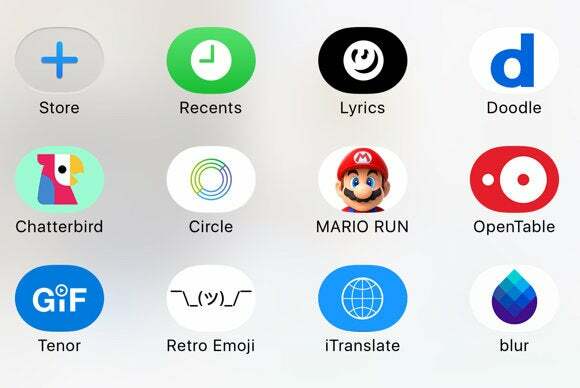 You can press down on any of these iMessage apps and extensions in the app drawer to make them wiggle so you can rearrange or delete them. In your app drawer, you’ll see your Recents, Music, Images, and Store. Recents displays your recently sent messages, whether it’s a Digital Touch creation or a handwritten message. Music lets you share your most recently played song from Apple Music, which will play in-line (more on that in the visual link section). Images lets you search the web for photos, videos, and GIFs. The image search results are powered by Bing, and the results are comparable to the GIF results in Google’s Gboard iOS keyboard. In the Store, you can browse the Featured and Categories tabs to get more third-party iMessage apps and extensions, including stickers, games, and services. 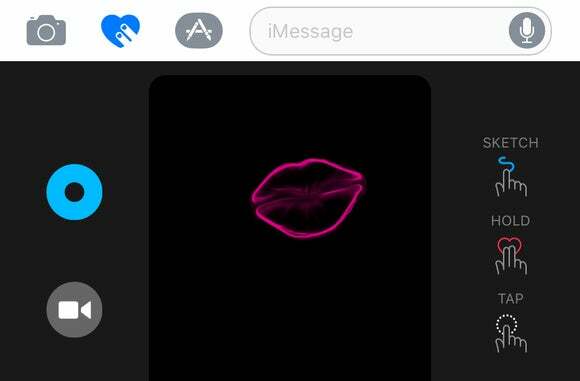 Here’s our list of 15 free iMessage apps to get you started. The Manage tab offers a quick way to see if any of your installed iOS apps have released a new iMessage extension, and here you also have the option to automatically add these extensions to your app drawer. One of the biggest crowd-pleasers at WWDC this year was the announcement that emoji would show up three times bigger in iOS 10. This applies if you are sending a message with only emoji, however. 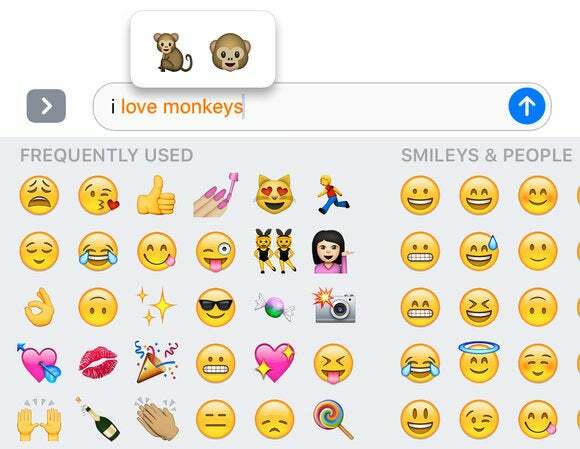 Text messages with an accompanying emoji retain the same size. 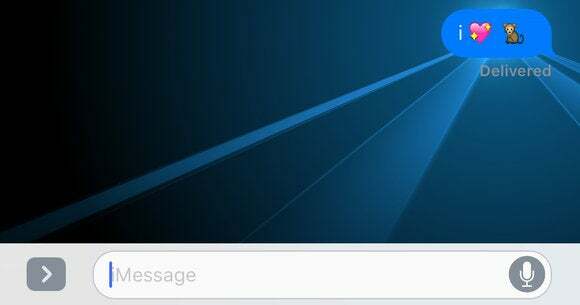 After typing your message, press and hold down on the blue up-arrow to the right of the input field. That takes you a “send with effect” page where you can slide up to select your text to appear as “Gentle” like a whisper, “Loud” as if you’re yelling, or “Slam” down on the screen. 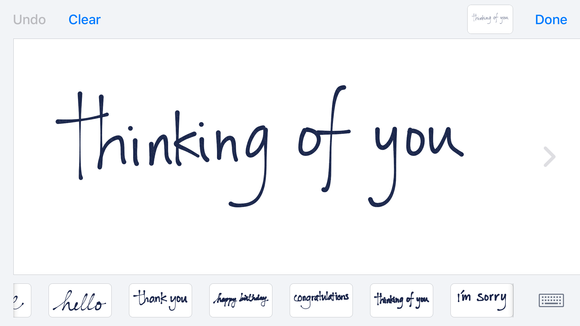 Here, you can also choose “Invisible Ink” to send a hidden message or photo that the recipient can reveal by swiping away pretend particles. If you’re having issues seeing bubble, fullscreen, or Tap Back effects, it’s most likely that you’ve enabled “Reduce Motion” to keep from getting motion sickness from iOS visualizations. To disable this option and try these effects, go to Settings –> Accessibility. Just be aware that as soon as you raise your fingers from the black canvas, the animation will be sent to the recipient. So make sure you have a clear vision of what you want to create before putting pen to paper, or finger to screen in this case. They show up as still attachments on iOS 9 or prior. To disable activating handwriting every time you rotate your phone, simply tap on the keyboard icon on the lower right of the handwriting screen. You can activate it again by tapping on the swirl that appears on the lower right when the keyboard is in landscape mode. If the recipient has installed iOS 10, these messages are displayed stroke by stroke, as if they had been handwritten in real-time. The ink also has a drying effect for an authentic pen-on-paper feel. If the recipient has iOS 9 or prior, these handwritten messages show up as still attachments. Lastly, Messages in iOS 10 has redesigned the way you attach media, whether it’s a photo in your camera roll or a video you’ve recorded in-app on the spot. Tap on the camera icon left of the input field and the keyboard becomes a media hub with a viewfinder for taking photos or video right there and then. You can continue browsing your camera roll by swiping left, or launch the Camera app or Photo Library by swiping right. Also, when you send a URL to an article on the Web, Messages automatically turns it into a preview with a headline and image pulled from the link. Similarly, you can send a link to YouTube or Vimeo and have the recipients watch the video in-line. 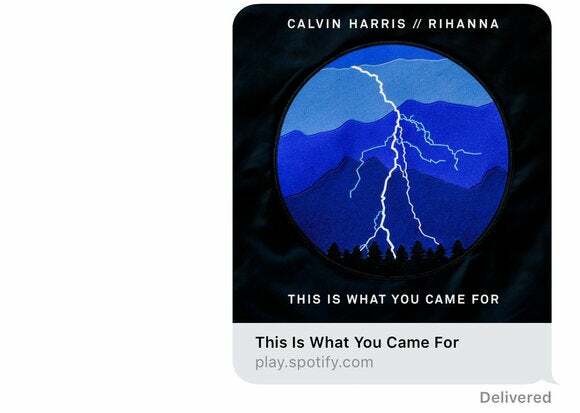 You can also play tracks from Apple Music without leaving Messages—there’s even an iMessage app for sharing songs from Apple Music. In fact, every URL we sent showed up as a visual link, from Twitter links to Spotify tracks.